Use Reply With Template software to create and send your own Microsoft Outlook email templates. Create Microsoft Outlook email templates using Reply With Template software. Reply With Template add-in for Microsoft Outlook. The most efficient reply template software. If you have to reply to a lot of incoming repetitive emails, pre-made reply templates will save you tons of time. After you have installed Reply With Template add-in, additional "Reply With", "Reply to all With" and "Forward With" buttons will appear in Microsoft Outlook toolbar. Just choose your template from the Select Template dialog and your Outlook reply template is ready to be sent. This is a perfect tool for active email users that will save your valuable time. 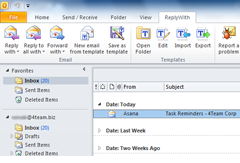 Create reply templates as easily as you create a new email in Outlook. There are no special forms or confusing instructions; just copy existing emails to the Outlook email templates folder and start using Reply With Template right away. You can use templates to reply to all recipients or send personal messages in just one click. I am currently using the trial of ReplyWith and it has been a huge time saver for me. I work in a university and I have students emailing me with RSVPs for orientation (I have 5 throughout the..."